for this column i want to show art that would actually look good in your home. while the raft of the medusa is super important, i don't think it is practical to have it hanging above your couch. personally, i prefer modern art for the bigger pieces in my house. right now i have two large canvases that are abstracted and modern, but i can tell you nothing about their authors. they are of the anonymous home-goods brand (when my father-in-law walked in to my house he immediately said they were not real art, i half agree with him. though i doubt that he would think the modern art that i do really like is 'real art'). someday i hope to have real copies of my favorite modern artists in my house. i think i will start with clyfford still. still was part of the abstract expressionist movement, and specifically was a color field painter (which means exactly what it sounds like). he believed that his works had no deep connections or associations. they were not meaningful or mythical. rather, they were just about the colors on the canvas. and he really did use the greatest colors. most of his works are centered on large forms of black and white, but many also incorporate oranges and reds. his works are massive! the collection that i saw at the met and the lacma were twice as tall as me. i wouldn't want my copy to be quite that big, but i would love for it to take up almost an entire wall. it will sit on the ground and lean up against a wall, preferably in my living room. unfortunately, art.com only has one clyfford still print available for order. the lacma website allows you to order my favorite still that i have seen yet (the one at the very bottom). this website allows you to order reproduction paintings which aren't too expensive and they have tons of stills. oh, and if you ever happen to be in denver there is a clyfford still museum there! check it out! Clyfford Still: Untitled, 1946-47, on view at the Metropolitan Museum, NY. close up of the image above. Clyfford Still: 1947-48-W No. 1, 1947-48, on view at the Metropolitan Museum, NY. 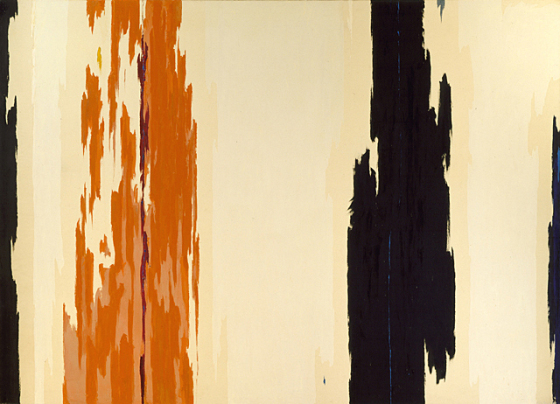 Clyfford Still: 1955-H, 1955, on view at the LA County Museum of Art, available to order on the LACMA website.